I am truly honoured to be a contributor to this anthology from the Haiku Nook community. Yanty’s Butterfly is an international haiku anthology dedicated to Yanty Tjiam and her family. Yanty was a haiku poet who passed away in 2015. She was a beloved member of our Haiku Nook community on Google+. In honor of Yanty, 20 poets from Canada, the U.K., Germany, Persia, Sri Lanka, Ukraine, South Africa, Taiwan, the Philippines, and the U.S. have come together to create this anthology. 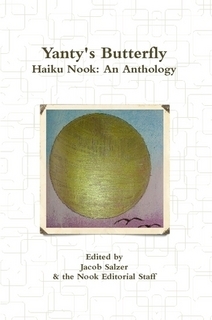 Yanty’s Butterfly consists of over 600 poems, spanning the variety of haiku forms: three-line haiku, two-line haiku, one-line haiku, four-line haiku, traditional haiku (5-7-5), concrete haiku, tanka, and haibun. Featuring haiku from Yanty Tjiam, George Klacsanzky, Fei Zhan, and award-winning poet, Alan Summers, Yanty’s Butterfly is an essential addition to the haiku literature of the 21st century. Yanty Tjiam (1981–2015) was a beloved haiku poet from Indonesia. She was the eldest sibling and is survived by her family and 2 younger brothers. She studied at North Sumatra University, majoring in English Literature. In the later years of her life, Yanty worked as an administrator in a CPO refinery factory. Her hobbies were gardening, reading, writing, and sharing. She never got angry. The Spirit of Yanty Tjiam remains in the hearts and minds of many. Her haiku and spirit remind us to live with compassion, simple kindness, and respect. She will be missed. We are a volunteer-based haiku community, dedicated to the sharing of haiku, senryu, tanka, haibun, shahai and other haikai-related literature. In the process of sharing and celebrating haiku, we are also empowered to make a difference in this world. All proceeds from Yanty’s Butterfly are donated to Yanty’s family and 2 charity organizations: ActionAid and The Hunger Project.